Youth Hunting At Its Best! When summer winds down and begins to transcend into autumn, I automatically think of squirrel hunting, and you can’t beat Michigan for pursuing this unique outdoor pastime. It doesn’t require much traveling anywhere in this state to discover great squirrel hunting opportunities. 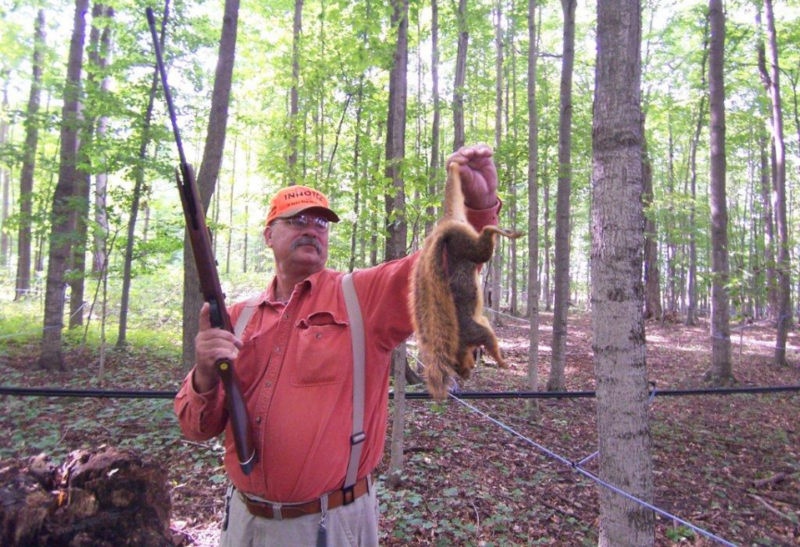 The problem is, small game hunting on a whole in Michigan, which includes squirrel hunting, is at an all time low these days in regards to hunter participation. This is a fact that utterly amazes me, because I thoroughly enjoy the wonderful essence of early autumn squirrel hunting, and it is something I have passed on to my three sons, and they in turn are passing it on to my grandchildren. It is a unique atmosphere that can offer complete relaxation combined with moments of frequent hunting action that is a great way to share an outdoor experience with kids. And you can’t beat the weather in the woods either, which can at times be outright balmy. When the mid-September squirrel opener arrives, the leaves on the hardwoods are still green, with only a hint here and there of autumn’s colorful splendor that is fast approaching. The woods are also still teeming with songbirds that have yet to migrate south, and squirrel hunting for a fact has turned me into a bit of a birdwatcher. I now never go squirrel hunting without my bird identification book, and the binoculars with me are as much for watching birds as for locating wary bushy-tails. Needless to say, I’m never bored with a day spent in the squirrel woods. I have a wide array of firearms that I employ for squirrel hunting, but my favorite squirrel rifle of all time is a .22 rimfire Model 39 Marlin Lever-action topped with a William’s peep sight that has been my frequent woods companion for almost 50 years now. With a butter-smooth action, it has become a natural extension of me. Other squirrel guns that I use entail a variety of .22’s, including handguns. I have a traditional caplock .32 caliber muzzleloader that adds a touch of unique nostalgia, as well as recent years have seen me using an air rifle. My scoped .17 caliber Gamo air rifle might not be absolutely quiet when I fire it in the woods, but its abrupt, coughing report is a bit more mellow than the typical firearms often used. I’ve noticed wary bushy-tails pay less heed to my shooting an air rifle in a dense and woodsy environment, and that works for me. When it comes to shotguns for squirrel hunting, I prefer the smaller bores, with a tight-choked .410 stoked with number 4 birdshot being my favorite. A shotgun definitely gives the shooter an edge in trying to hit a small target in the heavy foliage setting of hardwoods during early autumn (a favorite of mine is a T/C Contender .410 handgun with a 10 inch barrel). On occasion I enjoy using a bow and flu-flu arrows tipped with Judo-points as well. What hunting armament you wish to use for squirrel hunting is purely whatever is legal and suits your fancy and hunting technique (I haven’t tried a slingshot yet, but I have been seriously considering it). My most used hunting technique is simply sitting down in good squirrel habitat against a handy tree trunk and patiently waiting (and sometimes dozing off) for shots of opportunity. The key here is not to get up and retrieve each squirrel right after a shot because this visible movement in the cover alarms squirrels more than the sound of the shot. I mark the spot to memory where the squirrel falls, and stay put until I have finished hunting that spot, and only then do I get up and gather up any downed squirrels. I have on occasion bagged my daily limit of squirrels from one location in this manner. Of course some locations in the woods from day to day aren’t as squirrel-active as others, especially right where I’m sitting, and this will find me still-hunting (using eyes and ears more than feet while moving slowly through the woods one careful step at a time) to a more likely hunting site to sit at. This type of hunting can also turn into a spot and stalk event when a bushy-tail is sighted, and stalking into range of a squirrel can be a very challenging endeavor that I much enjoy, whether or not I get the shot. A friend introduced me to squirrel hunting with dogs a few years ago and I have been smitten with this technique ever since. It is a method that is full of action with the dog first finding squirrels by scent and then sight which is an important factor when dealing with squirrels that travel across branches from tree to tree. A good squirrel dog keeps an eye on its quarry once a squirrel is treed and the pooches can even retrieve squirrels after the shot. The dogs I hunted with were on the squirrels the minute they hit the ground after the shot. Large squirrel dogs are known as curs and the smaller ones are called feists and this type of hunting is an old American pastime that’s making a great comeback, at least in this neck of the woods (it has always been popular down south entailing some old and time tested bloodlines of squirrel dogs). I guess that is why I now own a little rat terrier that clearly qualifies as a “feist”, of sorts anyway. I’ve been giving her plenty of training on squirrels in the yard and we will find out soon enough how things have turned out when I’m able to shoot the squirrels she has treed. The proof will be in the pudding, as they say. Needless to say, I thoroughly enjoy the squirrel woods of early autumn in Michigan, no matter what hunting technique or hunting arm I choose to employ.